Helge Scherlund's eLearning News: Will Computers Redefine the Roots of Math? Kevin Hartnett, journalist and writer of the Brainiac column for the Boston Globe reports "When a legendary mathematician found a mistake in his own work, he embarked on a computer-aided quest to eliminate human error. To succeed, he has to rewrite the century-old rules underlying all of mathematics." On a recent train trip from Lyon to Paris, Vladimir Voevodsky sat next to Steve Awodey and tried to convince him to change the way he does mathematics. 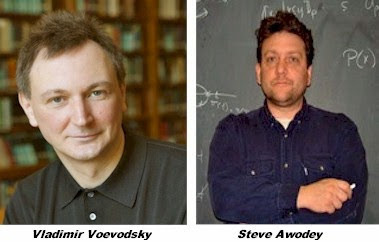 Voevodsky, 48, is a permanent faculty member at the Institute for Advanced Study (IAS) in Princeton, N.J. He was born in Moscow but speaks nearly flawless English, and he has the confident bearing of someone who has no need to prove himself to anyone. In 2002 he won the Fields Medal, which is often considered the most prestigious award in mathematics. Now, as their train approached the city, Voevodsky pulled out his laptop and opened a program called Coq, a proof assistant that provides mathematicians with an environment in which to write mathematical arguments. Awodey, a mathematician and logician at Carnegie Mellon University in Pittsburgh, Pa., followed along as Voevodsky wrote a definition of a mathematical object using a new formalism he had created, called univalent foundations. It took Voevodsky 15 minutes to write the definition. The idea of doing mathematics in a program like Coq has a long history. The appeal is simple: Rather than relying on fallible human beings to check proofs, you can turn the job over to computers, which can tell whether a proof is correct with complete certainty. Despite this advantage, computer proof assistants haven’t been widely adopted in mainstream mathematics. This is partly because translating everyday math into terms a computer can understand is cumbersome and, in the eyes of many mathematicians, not worth the effort. For nearly a decade, Voevodsky has been advocating the virtues of computer proof assistants and developing univalent foundations in order to bring the languages of mathematics and computer programming closer together. As he sees it, the move to computer formalization is necessary because some branches of mathematics have become too abstract to be reliably checked by people. “The world of mathematics is becoming very large, the complexity of mathematics is becoming very high, and there is a danger of an accumulation of mistakes,” Voevodsky said. Proofs rely on other proofs; if one contains a flaw, all others that rely on it will share the error. This is something Voevodsky has learned through personal experience. In 1999 he discovered an error in a paper he had written seven years earlier. Voevodsky eventually found a way to salvage the result, but in an article last summer in the IAS newsletter, he wrote that the experience scared him. He began to worry that unless he formalized his work on the computer, he wouldn’t have complete confidence that it was correct. But taking that step required him to rethink the very basics of mathematics. The accepted foundation of mathematics is set theory. Like any foundational system, set theory provides a collection of basic concepts and rules, which can be used to construct the rest of mathematics. Set theory has sufficed as a foundation for more than a century, but it can’t readily be translated into a form that computers can use to check proofs. So with his decision to start formalizing mathematics on the computer, Voevodsky set in motion a process of discovery that ultimately led to something far more ambitious: a recasting of the underpinnings of mathematics.